Whether you've dreamed of owning a compact travel trailer or a big 5th wheel toy hauler, here at TerryTown RV, we can make that dream a reality! We have a huge selection and super low, low prices. 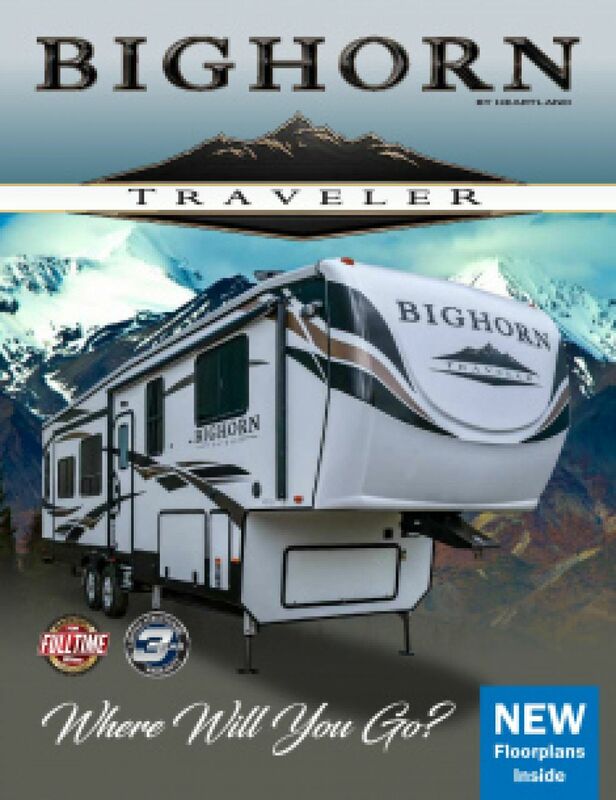 And you can own the 2020 Heartland Bighorn Traveler 39MB 5th Wheel at a price that will amaze you! Many of our deals can be done with no money down at rates that are lower than you'd imagine. So don't wait any longer! Stop in and see us today at 7145 Division Ave S Grand Rapids Michigan 49548 and let us make your dream of RV ownership come true! Don't live in Grand Rapids? No problem! We have satisfied customers throughout Michigan and across the country thanks to our 24/7 nationwide delivery service! Give us a call at 616-455-5590 and see how easily we can put you in this 5th Wheel so you can start building great memories of family fun vacations that you'll treasure forever! This 2020 Heartland Bighorn Traveler will let you get up and go whenever you're ready! It's easy to tow and maneuver with a hitch weight of 2525 lbs. and a GVWR of 16000 lbs. So travel the countryside with the whole family and enjoy outdoor shade and comfort under the 20' 0" patio awning! Spacious comfort is the hallmark of the 2020 Bighorn Traveler 39MB. At 42' 1" long and 8' 0" wide, with 4 slides, this RV has room for the whole family! Inside, there's plenty of headroom with 13' 3" of height. When the weather outside isn't pleasant, everyone will still feel comfortable and cozy due to the 35000 BTU furnace and the 15000 BTU air conditioner! The whole family will enjoy living in this spacious RV! It's 42' 1" long, 8' 0" wide, and there's plenty of headroom since it's 13' 3" high! The 4 slides maximize the interior space! No worries if the weather turns bad, either, because the efficient 35000 BTU furnace and modern 15000 BTU a/c unit will keep the climate inside completely comfortable! Food always tastes better when you're camping, doesn't it? And the full kitchen in this RV comes with a bevy of modern cooking appliances, including a 3 burner range cooktop that's perfect for whipping up bacon and eggs, flapjacks, sausage links, hamburgers, fish, and more! Store all your fresh foods and cold beverages in the 14.90 cu. ft. refrigerator! The 65 gallon freshwater tank provides enough clean water for the entire vacation! Flush your problems away with the bathroom! Inside there is a Porcelain Foot Flush toilet and a shower! The water stay hot for extended periods of time, thanks to this RV's 60 lbs. of LP tank capacity! The black water tank has 45 gallons and the grey water tank has 90 gallons. This RV has somewhere for everyone to sleep in comfort and privacy, even your children! They'll love the cozy bunkhouse in the back! 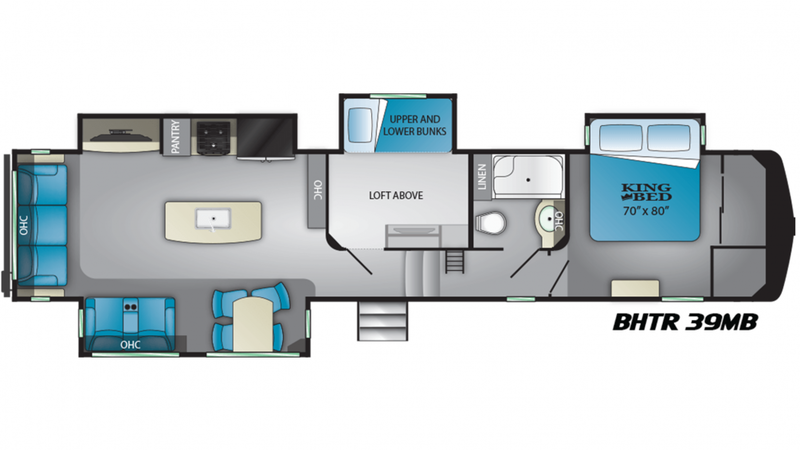 There's plenty of sleeping space in the 2020 Heartland Bighorn Traveler 39MB, especially with the awesome loft space. When the day of outdoor fun is over, kids and guests will love having their own private sleeping area where they can cozy down and drift off to dreamland!